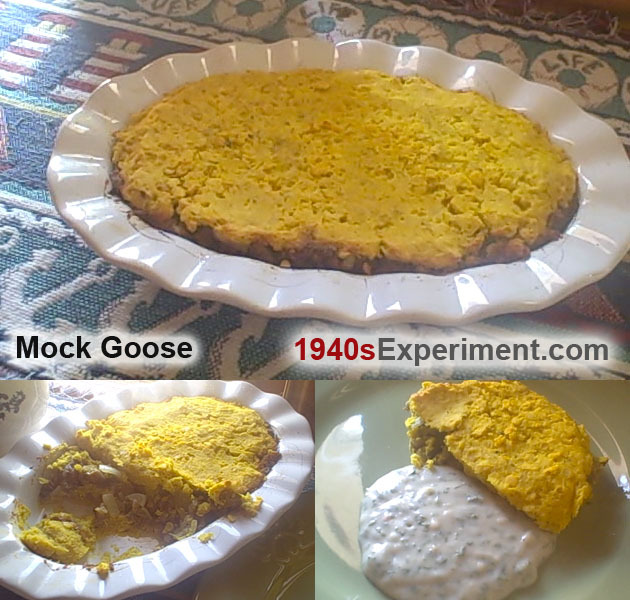 This entry was posted in recipes and tagged 1940s recipes, mock goose, wartime recipe. Bookmark the permalink. Fortunately, one of my favorite parts of the traditional American Thanksgiving is the stuffing which is easy to make vegetarian. I’ve tried the Tofurky stuffed roast which is pretty good but I’m just as happy to have stuffing, rolls and some homemade cranberry sauce and give the whole turkey, fake or otherwise, a miss! Oh I forgot- mostly I serve most of my dishes with lots of fresh vegetables!!! I have celiac disease so what can I use in place of the breadcrumbs? I am racking my brain trying to come up with an alternative. Make some gluten-free bread, slice and dry it, and roll it in a plastic bag once it’s hard. I found this recipe for mock goose that was printed in The Daily Mail, 1 Oct 1942. In a greased pie plate layer half of the potatoes then half the apples. Sprinkle with sage then half the cheese. Continue the layers in reverse. Apples, potatoes then the rest of the cheese on top. Pour in the vegetable stock. Bake in moderate oven for 3/4 hour. Blend 1 tablespoon of flour with 1/4 pint of stock or water. Pour it into the dish, bake for another 1/2 hour. Serve with a green vegetable. I also found a reference to a” Hampshire Goose”. No recipe, but the same idea as this one Layering potato, onion and sausages topped with cheese.